Basils Lemon Ocimum Basilicum Citriodorum is a half hardy annual herb native to India. Basil seeds are very easy to grow, and Lemon Basil grows fast forming an upright, bushy, herbaceous plant with narrow, ovate, lemon-scented, light-green leaves. Basil Lemon offers a different from other Basils scent which is pure, clean, citrus-lemon like, and its white flowers appear in summer attracting various pollinators including bees and butterflies. Basils Lemon is a popular herb for outdoor planting in containers and pots, or for growing indoors. Lemon Basil is often grown in containers on a patio to repel mosquitoes and flies. 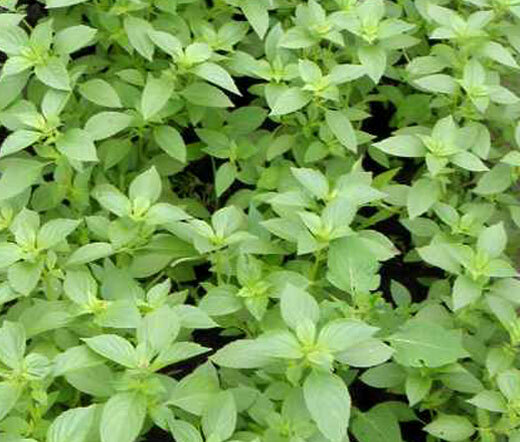 Ocimum Basilicum Citriodorum seeds can be planted directly outside, and the mature Basil likes to grow in full sun favoring rich, moist, well drained soil. Lemon Basil has a wide range of culinary uses - the Basil leaves are used fresh or dried in herb vinegars, fish, vegetable, and pasta dishes. Basil Lemon is freshly citrus scented and are mild enough for flavoring grilled fish or shrimp salad.